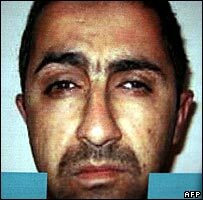 The Iraqi authorities have announced the arrest of a man they say is the second-in-command of al-Qaeda in Iraq. Iraq's national security adviser, Mowaffaq al-Rubaie, told a news conference the man, Hamad Jama al-Saedi, was detained a few days ago. 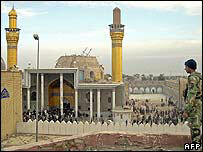 Mr Rubaie said the man was behind the bombing of a Shia shrine in Samarra in February that drew revenge attacks. American troops killed the insurgent group's key leader, Abu Musab al-Zarqawi, in June. "We announce today the arrest of the most important al-Qaeda leader after the criminal Abu Ayyub al-Masri. He's the second man in the organisation," Mr Rubaie said. This is a reference to the man believed to be al-Qaeda's current leader in Iraq, who remains at large. Iraqi and US officials have blamed the group for some of the worst attacks against civilians, and for inciting sectarian tensions between its Sunni supporters and Iraqi Shias. Mr Rubaie said Mr Saedi's arrest had dealt a severe blow to the group. Mr Saedi has been closely interrogated over the last few days and as a result, 11 second level leaders and nine other members of al-Qaeda in Iraq have been arrested or killed. Mr Saedi was hiding in a building north of Baquba that was being used by families, Mr Rubaie said. "He wanted to use children and women as human shields as our forces attempted to capture him." Mr Saedi was responsible for organising the bombing of the al-Askari shrine in February, Mr Rubaie said. The bombing led to a sharp rise in sectarian attacks across the country. The al-Askari shrine, part of the Imam Ali al-Hadi mausoleum, is one of Shia Islam's holiest sites and attracts pilgrims from around the world. In June, Mr Rubaie announced the capture of a Tunisian identified as Abu Qudama, who was one of several men wanted in connection with the attack. The BBC's James Shaw in Baghdad says the Iraqi government will see these latest arrests as a significant strike against the insurgency, particularly because they were carried out by Iraqi forces. But despite the reported successes against militants, parts of Iraq continue to be wracked by violence. On Friday, a report by the Pentagon warned that "the core conflict in Iraq (had) changed into a struggle between Sunni and Shia extremists."